Our products are widely demanded by the clients for its durability and reliability. Available in various sizes and specifications safe to use these products are available in the market at industry leading prices. Moreover, our products are available in the market at reasonable rates. Used In: Automobile industry, power industry, textile industry, etc. Minimum storage space (When not in use). We manufacture customized material Storage Racks, depending upon the customer's shop floor and storage items. 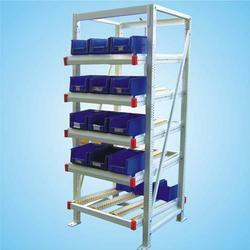 The Storage Racks help our customers to store their material and tools in a systematic form. This helps in adhering to ‘5S’ & ‘Kaizen’ principles. 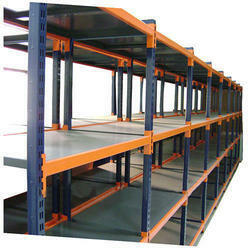 The Storage Racks also add to the accountability and maintenance of tools & raw material. Offering heavy Material Handling Racks that are specially designed to fulfill the storage requirements of various industries. It is available in various patterns and sizes and can also be customized as per the given specification. These heavy duty racks are robust and made by using heavy duty material to give an additional strength. VISHAKHA the group know as a solution provider can mould solutions and create a product as per the customers requirement to prove our selvse we give below the custom moulded products. Size (length x Width): As per client requirement. We are engaged in offering a quality tested array of Pallet Pull Out Rack. We have carved out a position in Manufacturing and Supplying an enormous range of Material Handling Racks.